The SciDome is now OPEN! Shows are scheduled daily during our open hours. See our calendar for a list of upcoming shows. SciDome shows are included in admission or membership and are reserved upon arrival. They are distributed on a first come, first served basis. Join us! Impact the future by supporting the SciDome. 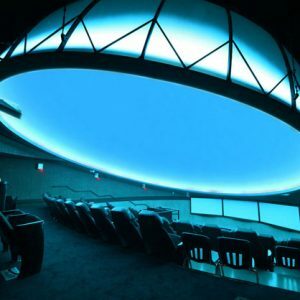 The Works and The Ohio State University at Newark announced on May 4, 2017, their collaboration to build a $1.4 million SciDome planetarium at The Works’ campus in downtown Newark. Marcia Downes, The Works’ managing director, noted that this unique public/private partnership will create an immersive science facility that will engage audiences of all ages, adding a complementary component to The Works’ already strong repertoire of STEM education programming. William L. MacDonald, dean and director of Ohio State Newark, said that facility and programming will provide internship opportunities for Ohio State students and technology for projecting state-of-the-art visual learning tools for a variety of courses, including but not limited to anatomy, physiology, biology, earth sciences, physics, and astronomy. The 2,200 square foot facility will house a 30 foot tilted dome with 4K digital projection and NanoSeam™ technology and theatre-style seating for 60 guests. Groundbreaking for the new building will happen in early June 2017 with completion anticipated in June 2018. A staggered opening is currently planned, with the SciDome first being utilized by The Works’ summer camps in summer 2018, followed by public offerings and use by Ohio State Newark anticipated in fall 2018. 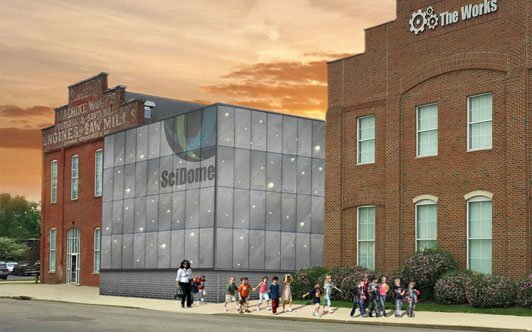 The SciDome will be located on the Works’ campus at 55 S. 1st Street on the site of The Works’ current Discovery Garden, between the museum’s administration building and main museum building, the former Scheidler Machine Works. Visitors to The Works will enjoy the SciDome’s interdisciplinary programs free with their paid museum admission or membership. Initial programming will include Starry Night and The Layered Earth fulldome simulations. Designed for educators by dome builder, Spitz, Inc., these planetarium presentations can be manipulated in real time to empower educators to customize each educational presentation.